The electronic tour system built into SOVA has features not found in other competitive products and was specifically built from the ground up to address the needs of a busy hotel. As hotel safety and security consultants ourselves, we understand the challenges hotels face with limited security staffing having to perform tasks that were traditionally reserved for other departments, like assisting the bell staff, collecting IRD breakfast orders and parking cars for valet. SOVA is right at home in this environment by allowing a security officer to pause his security tasks, record other activities, and resume his/her tour when ready. All of this activity throughout the user's shift is tracked, timed, and sent automatically to the Daily Activity Report (DAR) with no double entry. So go ahead and toss your DAR, you don't need it anymore. 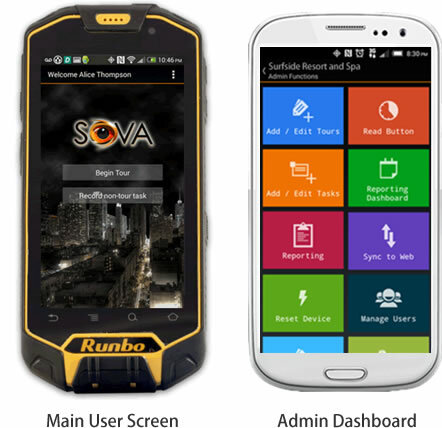 SOVA is the only electronic tour system that allows full functionality from the mobile device including admin functions, reporting, charts, and more. To get started with SOVA, you simply walk your property to apply durable RFID tokens in discrete areas to create checkpoints for your tour system that represent areas in your property that you want to ensure you have a security presence. When you register the RFID checkpoint, it saves GPS coordinates for the specific location to assist with our BackTrack mapping function. Next, snap a picture in the app to identify the location of the checkpoint to help new users learn the tour routes. Sync from your mobile device when finished with your tours and all mobile devices get updated automatically. It's that easy. Tasks can be assigned to tour checkpoints on the fly directly from an admin's mobile device, even remotely. Have a popup function happening that has some particular risks that you want covered? Simply add tasks to the tour buttons in this area prior to the function, sync your changes, and automatically all staff working the event are reminded of critical operational items. After the event, simply remove these tasks and it's back to business as usual.